The Tyrant Select basketball system provides extra duty toughness for high traffic play areas. Built to go the distance you wont have to worry about buying another system for decades to come. When it comes to the playground, no other basketball system can stand up to the TYRANT Fixed Height Basketball Goal! First Team's Tyrant basketball system is our largest, most rigid basketball system yet! With it's incredible 6 5/8" diameter galvanized post and outstanding 72" overhang, the Tyrant stands alone as the country's leading playground basketball system. First Team has incorporated its easy to install nosecone into the Tyrant pole structure design. This makes installing the backboard much easier, minimizing backboard lifting when installing the backboard. The Tyrant in INDESTRUCTIBLE and First Team backs it with our SUPERIOR LIFETIME WARRANTY! For added safety, pole padding and backboard padding are available for any Tyrant basketball package. So why let your basketball court be run down by other systems that can't hold up? 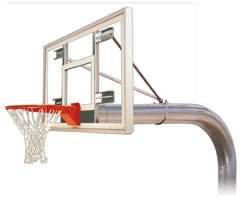 Let First Team show you the true meaning of reliability and toughness with the TYRANT Fixed Height Basketball Goal! Approx. Shipping Weight: 395 lbs.